In the lead up to International Women’s Day I sent out a bunch of cards to a bunch of women that in someway, shape or form rock my world and I think they are a bit awesome. I’d written before about giving bunches of lavender, this time I wanted to give a card. A few words, a tiny token of thanks for being a pretty wonderful woman in my life. Speaking of wonderful women, last Sunday I got to hang out with Elizabeth Gilbert and hear her talk on creativity. Hear a panel that included Germaine Greer and Clementine Ford, taking in their thoughts on “How to be a Feminist.” And lastly watching the documentary of Finding Vivian Maier. Three completely different trains of thought, that at the end of the day I think I felt a bit overwhelmed with. I felt charged and inspired with the first two and then watching the documentary on Vivian…in some ways it felt like the complete opposite to the first two. Certainly lots of bits to muse on over my notes anyway. Are you scribbling notes anywhere? What have you been up to? This entry was posted in Connecting with Community, Rambles, Waffles and Digressions and tagged All about women, Clementine Ford, Elizabeth Gilbert, Germaine Greer, international women's day by cityhippyfarmgirl. Bookmark the permalink. I love the color on your site.,is it new? 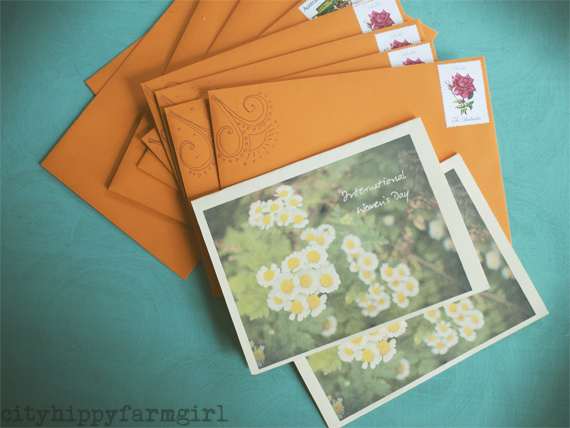 I have been sending snail mail often to people this past year. I am also part of a group that send postcards around the world to random people. Its fun. I ordered postcards with my photo on it and send them at random. I really enjoy it. Thx for sharing. I want to see that documentary. It’s good to send snail mail isn’t it Joanna. I adore getting it so I always think it’s worth going to the effort of sending. I also love the new header… the colour is gorgeous. I also love the idea of using International Womens day to give thanks to important women in our lives… I just hope I remember to do it next year! Also, just the other day I walked past a store advertising ancient sourdough starter… I thought of you! Now I wonder how much they were selling the starter for? Sourdough seems to be big business these days, which is great to see. That’s lovely to send cards. I went to an international women’s day afternoon tea where the host provided food and asked everyone to bring a bunch of white or purple flowers. While we ate she made bouquets from flowers from each bunch and everyone took a bouquet home – it was a really nice gesture! Just had a look at Vivian Maier’s photos and they are just beautiful. Vivian Maier’s photos are wonderful aren’t they. Try and see the documentary if you can Johanna. Her story is still sitting with me days later after seeing it. I saw the pics on your IG of your Sunday-how inspiring! And did you draw that little detail in the corner? So pretty! That was a lovely idea to send little cards to your favourite women! I wish I had done that too :). I’m turning over a piece in my mind for a non fiction writing competition, and just about ready to start putting pencil to paper. Now that Sara is a bit exciting. The beginning, the start, the planning. May your mind be clear and your pencil speedy! Yep. It’s true. She really does rock. Women are lovely things. They are soft around the edges when it matters and hard as nails when they need to be. They smell of “home” and “comfort” and Chanel No. 5 all rolled into one and when you find a good one, keep her, she will give you so much more than you could ever hope for. Good friends, of the feminine persuasion, give life it’s colour, it’s flavour and it’s vibrancy. Here’s to the women of the world! Beautiful header and happy Women’s Day to you. Thank you dear Zena and to you too.